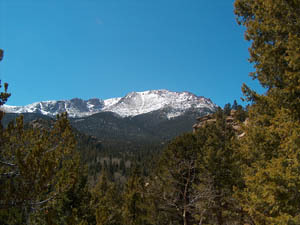 Pikes Peak is arguably the most famous Colorado 14er. First with most Americans since it was made famous by Katherine Lee Bates who wrote the famous poem "America the Beautiful" on the summit. And second with some climbers, some 15,000 a year, as the 14er with the highest vertical gain from trail head to summit - 7,400'. It is also popular with marathoners who make the run in as little as 3 1/2 hours or car racers who make it in 10 minutes! 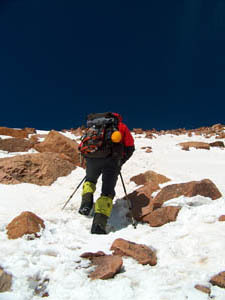 I have climbed Pikes 3 times as of 2012. This report is from 2006. In April, 2006, Patrick and I used as a shakedown for my upcoming Broad Peak and K2 climb. We took our time however by camping at Barr camp, summiting the next day, another night at Barr and back home. All in all a great weekend along with some surprises. 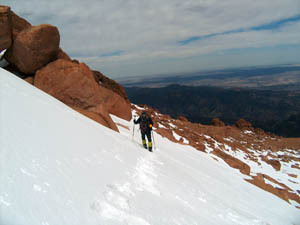 There are three primary routes up Pikes: West Fork, the Crags on the west side and the Barr Trail on the East. The Barr Trail is the longest - 26 miles round trip. With heavy packs and late Spring conditions, we thought this would be a good workout. Leaving the 6,600' trail head about 9:30, we took a leisurely pace on lower section of Barr Trail. The first four miles gains 2,000' and is popular with joggers and dogs who run the Incline and take the trail back down. I was amazed at how many people we saw and how many runners were talking on their cell phones - ordering a pizza? Seven miles from the trail head and at an elevation of 10,200', we arrived at the Barr camp around noon. This is a great place that I highly recommend. A married couple, Teresa and Neil live there permanently. The cabin was built by Fred Barr, the designer and builder of Barr Trail, between 1921 and 1924. 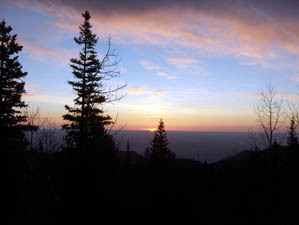 It was to be used as a halfway rest-station for the burro trips, which Barr led to the summit. More on these burros later! We stashed our packs on the back porch and laid our sleeping bags out on the bunk beds in the one room sleeping quarters. We chatted with all the other hikers on a day trip to the camp while enjoying cocoa and tea from Teresa. Soon it was obvious that Patrick and I were the only ones actually climbing Peaks this Spring weekend. After a huge spaghetti dinner courtesy of Teresa, we hit the sack for our 5:00 AM alarms. We decided to wait for sunrise since it was still very cold and zero chance of thunderstorms this weekend. 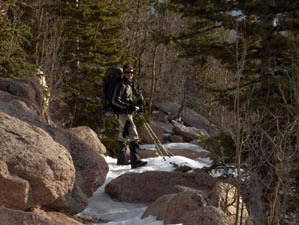 We layered up and headed out with snowshoes strapped to our packs. The temps hovered around 0F and there was a hint of a breeze. We followed the very well marked trail towards treeline enjoying the night lights of Colorado Springs to the east. As the breeze picked up, we added our gortex shells, gloves and face protection. Good thing because as soon as we cleared the trees it was cold, very cold with a stiff breeze blowing directly in our face. The Barr Trail is well marked and an easy walk - in the summer. 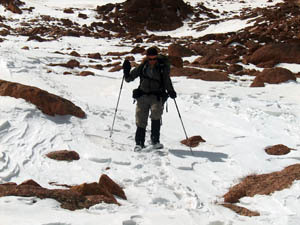 However our experience was that the route finding was curious at best with even a shallow snow layer on the ground. The trail meanders to the south before making a sharp u-turn to the north. Traversing the u-shaped gully that bisects Pike's east face, we soon made anther u-turn to cross back to the south side of the gully. Then - you guessed it - another u-turn and back across. One more time across the gully (this makes 4 for those keeping count) and we needed to make one more turn back to the north. You see, it seems that old Fred did not want to stress his mules so he made the trail long and lazy. I guess if I was carrying 100lbs of stuff on my back, I would have wanted it that way! We spotted a signpost for the "16 Golden Stairs" - apparently the base of a series of short switchbacks leading directly to the summit. We never saw any "steps" in the snow. Taking the direct route towards the summit we were greeted by a surprise - a train whistle! Now I know there is a road and a train to Pike's summit but it still felt strange to hear the whistle blow so loud and so close. We scrambled over the final big boulders and there it was - no, not the summit - the train! As we started towards the Summit House Restaurant, the conductor poked his head out of the engine window - "You guys want a ride down?" he politely asked. "No, I think we will walk back." I replied much to the delight of Patrick and entertainment of the passengers. We enjoyed some fresh pizza as we reflected on the wisdom of my snap decision. But soon we got on our way back down. Wanting nothing to do with those endless switchbacks and traverses, we took a direct route down the center of the gully knowing that the snow would protect the fragile ground from our shortcutting. In a couple of hours we were back near treeline and able to see the correct route we missed that morning. The afternoon sun had melted some of the snow and making the ice mushy as we plodded back to the Barr camp. On this late Sunday we had the camp all to ourselves and enjoyed the company of the caretakers. Leaving mid morning, we followed the well worn trail back to the top of the Incline. Patrick, wanting more of a workout, insisted we take the never-ending series of railroad ties down the final 2,000'. We had to dodge the runners. 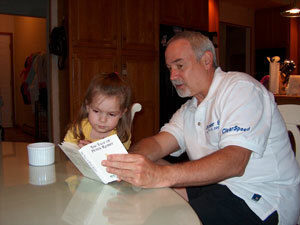 Back at Patrick's house I caught up with my favorite 2 year-old before heading home. Pikes Peak. A name that brings all sorts of images to many: The wild, wild west. America the Beautiful. A marathon. A drive. A railroad ride. Or a great Colorado 14er.